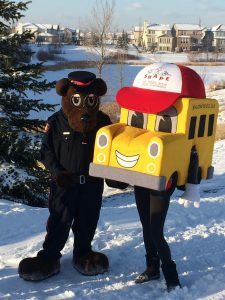 SHAPE’s (Safe Healthy Active People Everywhere) Walking School Bus mascot has found a new home in Calgary’s Copperfield School! On Monday, April 9, 2018, over 50 students, families, school administrators, staff, and other important guests gathered for the launch of the school’s Walking School Bus initiative. This initiative will see every Wednesday as the day for Copperfield students and families to focus on active travel. Walking and Wheeling Wednesdays aims to increase student physical activity while improving health and safety in school zones by decreasing traffic congestion. And let’s not forget about the fun that will be had by all who choose to walk or wheel! On hand for the launch was Jordan Pinkster, Chief of Staff for Councillor Shane Keating – Ward 12. Councillor Keating is an advocate for active transportation and encourages students and families to walk, roll and ride to school. Mr. Pinkster was joined in attendance by Calgary Safety Council’s Simon the Safety Bear who doled out hugs for students and lead them safely on their walk to school. Fun, inclusive promotional days such as this create excitement around active travel and give families a moment to pause and reconsider their travel modes to school. The physical, emotional and social benefits of walking and wheeling – even partway! – are well worth the change.